Roadside sign, the only place you'll see the new logo. Back in January of 2008, I visited the Super Kmart Center in Rome, GA and it was featured on the site in July 2009. At the time of the visit, it was the last remaining Super Kmart Center in Georgia and one of the last few in the Southeast. Unfortunately, as reported in the previous post about this store, it was downsized into a regular Kmart and the expanded grocery section removed by May of 2009. Fast forward to January 2012, four years after my original visit to this store. I traveled back to Rome to photograph the store again, this time with it being just a regular (albeit very large) Kmart. This store was originally opened as a Super Kmart Center in 1993/94 and is 177,786 square feet in size. It was one of Kmart's larger format Super Centers, as they did experiment with smaller ones that were in the 140,000 sq ft range. No more Super Kmart Center here. Upon pulling up to the store, I noticed the Kmart Express gas station and convenience store in the parking lot was still operating and evidently still going strong. I found a flyer in the store advertising a promotion for the gas station with the Shop Your Way rewards card. If you spent a certain amount of money on pantry items in the store, you would get a discount on your gas at Kmart Express. They also offered a promotion where if the blue light on the gas station price sign was flashing, everyone would get 5¢ off a gallon on gas. Inside the convenience store, they offer the typical items including fountain drinks and Nathans Famous hotdogs (like at the K Cafe's.) One cool thing is they sell lighters with the Kmart Express logo on them for 89¢. An interesting thing to note is that the logo for Kmart Express in all current advertisements still features the pre-2004 Kmart logo. I wonder how many gas stations Kmart still has in operation? This has to be one of the only ones left. Kmart Express gas station and convenience store. The former Super Kmart Center street sign now just features the current Kmart logo on it. The actual building still has the pre-2004 logo. All that was done to the building was they removed the Super and the Center on each side of the Kmart logo. They also did that for the signs above the exit doors inside the store. Both entrances on each side of the store are still open to enter and exit from. The right side of the store still has the vacant Auto Center. It looks exactly the same as it did four years earlier except for a couple new "For Lease" signs on it. Unfortunately, the parking lot had a lot less cars in it than did during my previous visit. The open 24 hours signs have been removed on the outside of the store too, as that stopped with the discontinuation of the grocery section. Entrance on the former grocery side. I entered the store on the right side, which is the general merchandise side. The store features a decent size electronics department on the right side wall just past the lawn and garden area. The appliance department has been moved to a new spot from my previous visit. It was now next to the electronics department, when in the previous visit it was on the back left wall next to the produce department. The new spot for appliances, next to the electronics. The entire middle part of the store has the clothing, shoes, accessories, and jewelry departments. The back wall has automotive, toys, sporting goods, hardware, and home decor. The back left wall where the appliances used to be is now the furniture department. The top of the wall still has all of the brand name advertising for the appliances on it though. It was cheap looking, I don't know why they just didn't take that down. The strip of the store to the left of the clothing department in the middle features the kitchen items, office products, and a few other things. Looking towards the Men's clothing section. Former spot of the appliances, now home to furniture. Now to the interesting part, what became of the grocery side of the store? Well, honestly nothing did. They put up shelving blocking the entire length of the former grocery area. It runs from the back wall, all the way up to the front wall. There is a large white plastic curtain that runs from the top of the ceiling down to the back of the shelving units, to hide any remaining trace of the former grocery area. All of the lights are turned out in the area that's closed off also. Bad news is the K Cafe/Deli Cafe is also closed and blocked off with the rest of the grocery area. The 'new' pantry area is several short aisles of shelves directly in front of the closed off area. It features all of the typical items found in normal Kmart stores pantry departments. It even has the old, sad looking coolers found in regular Kmart stores for the small dairy products section. They must have trucked those in from another (closed?) Kmart. While it was a Super Kmart Center it never had those coolers, it had real dairy cases. Looking towards the walled off former grocery area. Sad, old coolers replace the former full size dairy department cases. Moving to the front of the store, it still has the Pharmacy on the front wall next to where the K Cafe used to be. The store features 13 checkout registers, which is less than it had when it was a Super Kmart Center. They removed some of the registers including the express lanes that were closest to the grocery side exit. That area now has books and magazines. The front wall across from the checkouts features a still operating Floral department. It has a lot smaller selection of flowers, but it's still open and they were even advertising it over the intercom with a prerecorded message. Next to that is a Game Room with several older arcade games in it. I must say that this is a real rarity in a current Kmart, it's probably one of only a very small handful still open. Next to that is the Customer Service area and a new refreshment bar. It has a coffee and soda fountain, both of which used to be in the K Cafe/Deli Cafe. And finally next to that is a large, still operating Olan Mills Portrait Studio. Looking towards all 13 checkout registers. That pretty much sums up this store in its current state. I will say this is still a very nice Kmart store. It's huge now for a regular Kmart and is very well kept up. Since this store is only about 18 or so years old, unlike the majority of Kmart's built in the 60's and 70's, it looks newer and is in considerably better shape. It's a shame they removed the grocery side from it, but that's the direction Sears Holdings seems to be heading to. I was able to see a little bit of the old grocery area and the K Cafe, as there were a few gaps in the shelving units. I held my camera through them and snapped a couple pictures of it. It's amazing, the K Cafe has been untouched since it closed. The trash cans are still in place as is the fake plants on the wall. They basically just closed it down and walled it off. The signs on the wall above the bakery advertising the different cakes they design are still hanging up. All of the deli, bakery, meat, frozen, and produce refrigerated cases seem to have been removed though. Looking behind the shelves and tarp at the old K Cafe seating area. Behind the shelves and tarp reveal the old bakery department. Who knows what will end up with that part of the store, it's already been closed off for over two and a half years. My guess is that it will remained closed off until the store eventually ever closes down completely. What's your thoughts on this store and our revisit to it? Leave your comments below and enjoy the pictures! Inside the Kmart Express convenience store. Outside garden shop, closed for winter. Looking towards the Garden Shop area. 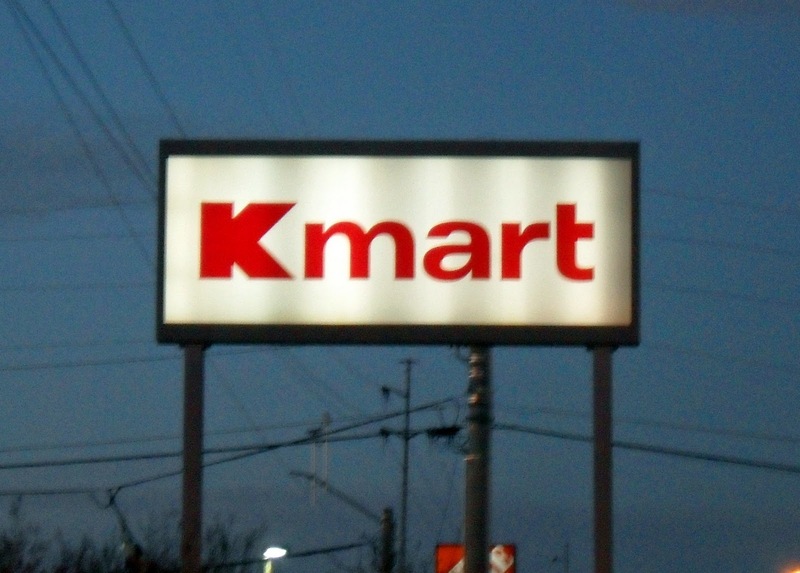 Kmart sign is so faded, you can hardly read it when it's lit up. Front alley of the store. Looking towards Women's clothing section. Fitting rooms for Men and Women were in the kids clothing area. Looking towards the Garden Center. Looking towards all the Pantry aisles. Walled off former Grocery section in the background. Looking towards where the K Cafe/Deli Cafe used to be. Looking towards back of store from the Pantry aisles. Another shot of the former K Cafe behind the shelves blocking it. Another shot behind the shelves of the former Grocery area. Olan Mills Portrait Studio still in business, just closed for the day. very cool post. I have never been into a Converted Super Kmart store before , but I plan to soon. I hope to be able to do a post on the converted first Super Kmart ever in Medina, Ohio since it is kind of close to home. The Medina store is slated to close and has been downgraded with a lack of updated signage. The Medina store lost most of the customers that still shopped their to Walmart after the conversion. I want you to also know that I found a video of the process of downgrading that Super Kmart in Medina on youtube. The reason they trucked in the old coolers was because the newer coolers are behind the barrier. If a miracle happened and they decided to reopen the grocery side, then they could because all the fixtures (including the cooler) are still there. When a Super Kmart is converted they usually remove all of the refridgerators a few may still have refrigerators intact, but this is not one of those store. The video link I pasted above shows how Kmart usually converts a Super Kmart to a regular Kmart. I still wonder why Kmart will not remodel their stores and make them profitable. Sears DOES have money, instead of losing it, they could invest it in a store. Maybe launch a prototype or two. It might just be a success. Even if it IS somewhat of a good idea (mygofer?) Sears does basically nothing. Ive been to a bunch of former Super Kmarts now. Ive seen 2 that use the old grocery side for a Sears Outlet (that sell appliances mostly) and ive seen 1 that has it walled off, like the one shown. All of them have been very clean, really nice, bright, and inviting. Out of the 3 ive seen, only 1 has a K Express gas station, thats in Greensboro, NC. They have some of the nicest looking graphics on a gas station! surprised perishable flower section is still there... pretty neat photos though! thanks! what a waste it seems they could of reformatted there grocery to a grocery with less parishables more frozen meats amd packaged vegetables sort of like and aldis low prices less waste. The Sears side is losing money but the Kmart is keeping the company a float. If Lambert did not merge the 2 and just remodeled the Kmart's like they said after coming out of bankruptcy. The curtain says it all.If there not willing to spring for Dry Wall and a New Sign there probably just tring to pay the rent until the lease runs out. The curtain says it all.If there not ready to spring for a ne Sign or some Dry Wall there probably just trying to break even till the lease runs out. Now, it'll be no more Kmart as a whole in Rome, GA at all. Rome's Kmart is fixing to close for good.